Nebraska is home to a variety of colleges and universities, and perhaps not surprisingly, many have well-developed agricultural programs. But there are hundreds of other potential majors to choose from, on campuses that are right in the heart of bustling cities. In this guide, we'll explore the best Nebraska colleges, look at the affordability and financial aid, and even delve into what alumni make ten years after they enroll. We also present comprehensive college planning tools designed to help students on the road to educational success. Read on to learn more about the diverse opportunities available at colleges in Nebraska. Even though Nebraska has dozens of colleges and universities to choose from, they are not all created equal. They each have unique traits and characteristics that mean an ideal school for one student may be a poor choice for another. The following ranking lists Nebraska schools based on various characteristics that most students will want to consider, such as student-to-faculty ratio, tuition and graduation rate. Published in-state tuition and fees for undergraduate students. Annual median earnings 10 years after entering the college. Only includes former students who received federal financial aid. First-time, full-time undergraduates receiving grant or scholarship aid directly from the postsecondary institution. Cost of attendance, financial aid availability and type of educational institution are just a few variables for prospective students to consider. This search tool allows students to choose their own criteria, then drill down into the colleges that meet those needs. The tool even allows for side-by-side comparison of the competing institutions. College is a serious undertaking that often represents a big step in personal and academic growth. It's also a powerful academic and financial step, so there's no wonder so many students need in-depth resources to help them navigate the educational waters. These state resources can help students transition to college life and make the most of their experiences. The CCGAP is a recently enacted piece of legislation that provides state funds for community colleges to provide financial assistance specifically to students planning to take courses that can lead directly to jobs in professions that desperately need workers. This program deliberately makes these funds available only to students enrolled in programs that do not offer academic credit toward a degree. The goal of the program is to bridge the financial aid gap, which exists because much of the federal financial aid opportunities go to students who are attending school for credit and not those who seek training and education for professional skills and subsequent employment. Nebraska Career Connections helps high school graduates maximize their potential, whether entering the workforce, gaining professional training or obtaining a college degree, certificate or diploma. Specific resources for college students include career advice, networking opportunities and information on additional education and training opportunities. There's also a directory of Nebraska businesses that help individuals looking for a particular job understand what professional and academic development opportunities are available. The NEST Direct Plan provides a selection of investment vehicles sponsored by the state of Nebraska and run by the Nebraska State Treasurer. The NEST Direct Plan offers 529 college savings plans, investments that have the primary benefit of tax-deferred growth, providing the proceeds contribute to higher education costs. The benefits can be used at most educational institutions across the country. Setting one up is fast and simple and can allow anyone to start saving for college while enjoying certain tax benefits. A school's tuition is just part of the picture when it comes to figuring out the true cost of college. Though looking at the tuition rate can be sobering, financial aid packages tend to cut that cost down quite a bit. But how much does financial aid help, exactly? Though a significant portion of financial aid comes from the government, a nice chunk of it comes from the schools themselves. These charts give students an idea of what to expect from Nebraska colleges, including the fees and tuition they might encounter, as well as the financial aid award that can offset that expense. * Institutional aid represents grant and scholarship funds directly awarded by a postsecondary institution. * Financial aid data represents 4-year public and private nonprofit schools only. To help give prospective students an idea of what they can expect to pay at some of the more affordable colleges and universities in Nebraska, here is a ranking of the top six Nebraska schools in terms of net tuition price (which is tuition less any financial aid awarded). There is also a comparison of the net price of Nebraska's most affordable schools in relation to the national average. Cost for students awarded federal financial aid, after school and government aid is deducted. At public colleges, only applies to in-state students. Note: Rankings/data represent 4-year public and private nonprofit schools only. One of the most pressing questions is all about bucks: How much will a graduate make? Having a ballpark number in mind can help students decide if a particular school or avenue of study will be worth it, at least from a financial perspective. In order to help with this analysis, we took a look at how much from these Nebraska colleges alumni earn, and how that compares to the national average. Only includes former students who received federal financial aid. There has been a lot of talk recently about the amount of debt college students are faced with after graduating. A high salary is nice, but that obviously isn't the only thing that matters. An average or even "low" salary can look a lot better if there is little or no college debt. Here are the top schools in Nebraska for graduates with the lowest amount of student debt. Only for undergraduates who completed college; does not include Parent-PLUS loans. In addition to looking at a school's tuition and the financial aid available, students should also look at living expenses. Perhaps the college is quite affordable, but the area nearby is not - then what? Knowing those facts can help students make the big college decisions. The following information about cost of living in Nebraska is vitally important for those who want to attend Nebraska colleges or universities. Accreditation is the process by which an independent organization reviews a given school or program and ensures the school provides a certain standard of instruction. Accreditation is vitally important because it ensures a degree means something. While accreditation won't necessarily ensure the highest quality education, it will ensure that students receive at least a minimum level of instruction, and that the school is a respected one - not a diploma mill. University of Nebraska’s civil engineering program is accredited by ABET. Creighton University’s law school is accredited by the American Bar Association. Lincoln serves as the state capital of Nebraska. Founded in 1867 and incorporated in 1869, Lincoln hosts several colleges and universities. 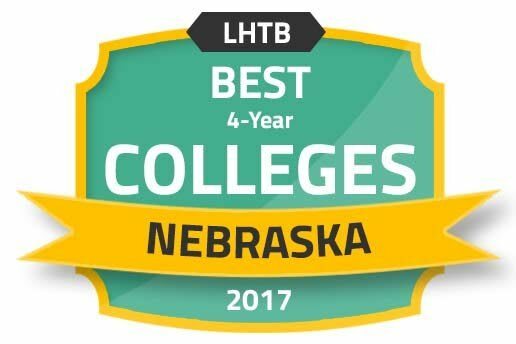 In 2015, Livability.com ranked Lincoln as a top 10 college town. With a flat layout, Lincoln is perfect for walking or biking around town to enjoy its many eateries, museums, shopping locales, or sports venues. With a growing economy, Lincoln also provides great job opportunities for those graduating from local colleges and universities. Chartered and founded in 1869, the University of Nebraska is an internationally recognized educational and research institution, with a student body comprised of over 25,000. To provide a high-class education to so many students, the University of Nebraska has an array of academic programs in a diverse set of colleges, including agriculture, engineering, fine arts, law, journalism, architecture and business. SCC is a public two-year college providing degree, certificate and diploma program options in over 50 areas. Areas of study include nursing, design and drafting, hospitality, paramedic and nondestructive testing technology, among others. The college does a great job in preparing students for either working or continuing their education - graduates have a 94 percent rate of finding work or continuing their education once they have finished their program at SCC. For students seeking a top-notch liberal arts education from a Christian-oriented school, Nebraska Wesleyan is a great choice. Founded in 1887 by Nebraska Methodists, NWU offers over 106 programs to 2,100 students. There is extra emphasis placed on students studying abroad and service-oriented learning. Like many other private schools, personalized attention from professors is the norm, with an average class size of 19 students and a student-to-faculty ratio of 13:1. Founded in 1854, Omaha has a long and rich history, dating back to the original Native Americans who inhabited the area and welcomed the homesteaders who eventually settled there. Extensive downtown revitalization has made Omaha an even more attractive place to live, work and study. In addition, Omaha has become an ideal area for students in the local colleges and universities to spend their leisure time and live after graduation. Founded in 1974, MCC has evolved into a public community college providing 40,000 students with an education in more than 100 program areas. Areas of study include culinary arts, allied health and academic transfer programs. Despite being a public college, students enjoy small class sizes, with the average number of students per class at 14. This is possible thanks to the extensive faculty available - over 200 full-time and 700 part-time faculty members. In addition to providing a great education, Creighton University is a Jesuit-based university with a special emphasis placed on helping others. In fact, students provided over 1.1 million community service hours in 2015. Founded in 1878, Creighton currently has nine schools and colleges offering various academic subjects, such as law, business, health and physical therapy. The entire student body consists of about 8,000, yet the students enjoy a student-to-faculty ratio of 11:1. This college began as the first nursing school in Nebraska, way back in 1888. Today, Clarkson College offers many more programs, including graduate degrees; however, the college has retained its original healthcare focus, with most programs revolving around medicine. In 2015, student enrollment was about 1,200 with board passage rates across multiple health disciplines equaling or exceeding the national average. This has led to 91 percent of graduates obtaining employment within their field. Ready to consider the colleges in Nebraska that might be the best fit? To help plan and prepare for college, we've compiled the following list of resources to help during various points of the college process. The AICUN works on behalf of independent colleges and universities in Nebraska to improve the education offered to postsecondary students. EducationQuest is a nonprofit organization with the mission of facilitating access to college in Nebraska. A variety of free services are provided, including scholarships, college planning advice, and outreach services. MHEC was founded in 1991 and consists of 12 member states (including Nebraska) in the Midwest region. MHEC exists to facilitate learning opportunities at any of the member schools. The Nebraska's Coordinating Commission for Postsecondary Education was created by constitutional amendment in 1990 to oversee the administration of Nebraska's colleges and universities. The NSCS is an alliance of Chadron State College, Peru State College and Wayne State College. The NSCS exists to facilitate the learning opportunities for students at these schools. Transfer Nebraska assists students looking to transfer between Nebraska's colleges and universities. One of the most useful features allows students to confirm that a class at one institution will be credited at another institution.